Beginning January 1, 2012, no certificate of title will be issued for any motor vehicle more than thirty-five (35) years old. Effective January 1, 2012, no certificate of title will be issued for any trailer, semi-trailer, travel trailer or pop-up camper more than twenty (20) years old. If a lien holder holds the valid title, then a copy of the out-of-state title is necessary. A fax copy is acceptable. If the surrendering state provides electronic title issuance to the lien holder, then a title confirmation statement should be provided and include information listing owner, vehicle and lien holder. The Motor Vehicle Division office fax number is 334-702-0032. In many states the owner listing on the face of the title differs from payment books and tag receipts. A physical inspection and verification of the VIN and descriptive data shown on the title application is required for each vehicle brought into Alabama with an out-of-state title. Vehicles and trailers may be brought to the Courthouse or State Form MVT 5-10 (download form)may be completed by a governmental law enforcement officer in Alabama. Utility trailers pulled by a bumper hitch are exempt from physical inspection. Private Passenger Vehicle. An owner is required to sign his title application for ownership certification and vehicle description verification. If joint ownership is reflected by the conjunction 'and' or by the absence of a conjunction, then each owner must sign the title application. If joint ownership is reported by the conjunction 'or' or 'and/or', then only one owner must be present. If an owner is unavailable, then he may appoint another person by notarized Power of Attorney(download form)The appointee may act on behalf of the owner by providing supporting documents, signature, fees, etc. Lease Vehicle. A leasing company located outside of Alabama, which leases a vehicle that will be domiciled in Alabama, shall furnish the residence address of the lessee and grant Power of Attorney (download form) to an appointee to sign title application. The lesser shall remain owner as listed on surrendered title and Alabama title shall be mailed to owner's mailing address as provided. 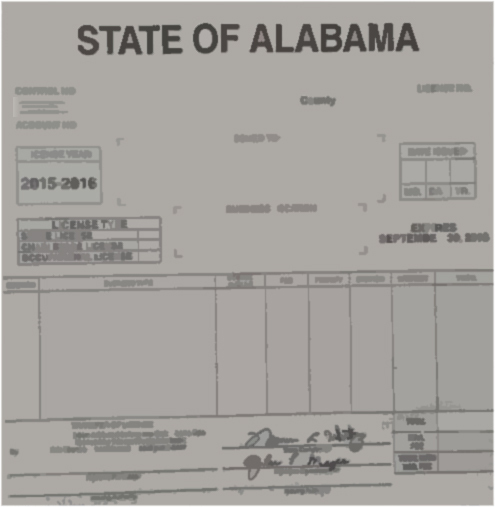 The owner provides evidence that they are in compliance with Alabama law related to liability insurance coverage on their vehicle. A valid out-of-state driver's license or state issued id card may by presented by a new resident within the required days to change to an Alabama drivers license.